Today I want to share some gift ideas for 20-somethings (mostly female since thats what I relate to lol). Early to mid twenties is a really weird time for gift ideas, its really hard to find things that they need since they're out of the toy phase and can buy clothes and stuff when they want it through the year. I use headphones everyday, on the train, working out, walking home. I think its important to get a good pair of headphones because the earbuds can be really irritating on the ears. I think these headphones from Frends are super cute and if you're going to get headphones they might as well be aesthetically pleasing! These are the years where people are moving out and living on their own which means fending for themself! Coming up with healthy ideas to cook every night is hard and I never think to buy myself cookbooks so I would love to get one form christmas since its something I can use all year. This one is a little more obscure. But if the person you're shopping for has a hobby they like to do in their spare time then getting something for their hobby would be a great gift. An example is that I have been figure skating for a long time and getting skating tights for something for my skates would be a great gift and I also love photography so getting some lights or a tripod or something would be nice too. So thinking of something thoughtful just for them is a great route to go! If you live in a climate where you need a coat this time of year it can be a great higher end gift idea. Coats can be very expensive so I know I would appreciate getting this as a gift since people in their twenties don't make a whole lot of money. This goes hand-in-hand with the cookbook one. People in their twenties are just starting to move into their own places and could use some apartment items like kitchen supplies. 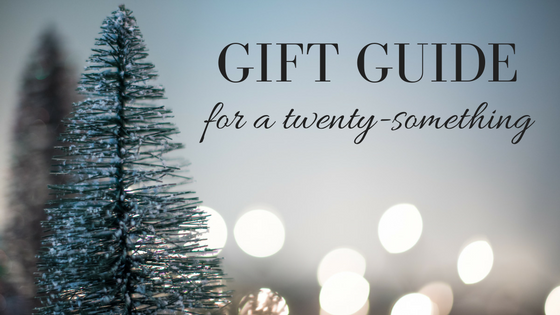 Those are my gift ideas for twenty-somethings! I hope you liked this post!